Last week, the Japanese Aerospace Exploration Agency‘s (JAXA) dropped an explosive warhead on the surface of asteroid 162173 Ryugu. You might think this was the opening line of an entirely-readable science fiction novel, but it’s totally true. The operation began on April 4th, when the Hayabusa2 spacecraft sent its Small Carry-on Impactor (SCI) down to Ryugu’s surface and then detonated it to create a crater. Japan’s Hayabusa2 spacecraft has completed an important part of its mission to asteroid Ryugu. The spacecraft descended to the surface of the asteroid to collect two samples with its sampling horn. We don’t know for sure if samples were successfully collected, but all indications are that the sampling mission went well. Japan’s Hayabusa2 mission is about to get down to business. After arriving at asteroid Ryugu at the end of June 2018, and dispatching its tiny rovers to the surface, the spacecraft is about to approach the surface of the asteroid and get some samples. On October 5th, 2017, Vice President Mike Pence announced the Trump administration’s plan to return astronauts to the Moon. Looking to the long-term, NASA and several other space agencies are also intent on establishing a permanent lunar base there. This base will not only provide opportunities for lunar science, but will facilitate missions to Mars and beyond. The only question is, where should such a base be built? For many years, NASA, the ESA and other agencies have been exploring the possibility of stable lava tubes as a potential site. According to new study by a team of international scientists, the presence of such a tube has now been confirmed in the Marius Hills region. This location is likely to be the site of future lunar missions, and could even be the site of a future lunar habitat. In 2009, data provided by the Terrain Camera aboard JAXA’s SELENE spacecraft indicated the presence of three huge pits on the Moon. These pits (aka. “skylights”) were of particular interest since they were seen as possible openings to subsurface lava channels. Since then, the Marius Hills region (where they were found) has been a focal point for astronomers and planetary scientists hoping to confirm the existence of lava tubes. The recent study, titled “Detection of intact lava tubes at Marius Hills on the Moon by SELENE (Kaguya) Lunar Radar Sounder“, recently appeared in the journal Geophysical Research Letters. The team consisted of members from JAXA’s Institute of Space and Astronautical Science (ISAS), Purdue University, the University of Alabama, AstroLabs, the National Astronomical Observatory of Japan (NOAJ) and multiple Japanese Universities. Together, they examined data from the SELENE mission’s Lunar Radar Sounder (LRS) from locations that were close to the Marius Hills Hole (MHH) to determine if the region hosted stable lava tubes. Such tubes are a remnant from the Moon’s past, when it was still volcanically active. These underground channels are believed to be an ideal location for a lunar colony, and for several reasons. For starters, their thick roofs would provide natural shielding from solar radiation, cosmic rays, meteoric impacts, and the Moon’s extremes in temperature. These tubes, once enclosed, could also be pressurized to create a breathable environment. As such, finding an entrance to a stable lava tube would the first step towards selecting a possible site for such a colony. Granted, the LRS was not specifically designed to detect lava tubes, but to characterize the origins of the Moon and its geologic evolution. For this reason, it did not fly close enough to the Moon to obtain extremely accurate information on the subsurface. Nevertheless, as SELENE passed near the Marius Hills Hole, the instrument picked up a distinctive echo pattern. This pattern was characterized by a decrease in echo power followed by a large second echo peak. These two echoes correspond to radar reflections from the Moon’s surface, as well as the floor and ceiling of the open lava tube. When they analyzed this pattern, the research team interpreted it is evidence of a tube. They found similar echo patterns at several locations around the hole, which could indicate that there is more than one lava tube in the region. To confirm their findings, the team also consulted data from NASA’s Gravity Recovery and Interior Laboratory (GRAIL) mission. Consisting of two spacecraft, this collaborative effort collected high-quality data on the Moon’s gravitational field between 2011 and 2012. By using GRAIL data that identified mass deficits under the surface, which are evidence of caverns, the team was able to narrow down their search. On Earth, stable lava tubes have been found that can extend for dozens of kilometers. To date, the longest and deepest to be discovered is the Kazumura Cave in Hawaii, which is over a kilometer (3,614 feet) deep and 65.5 km (40.7 mi) long. 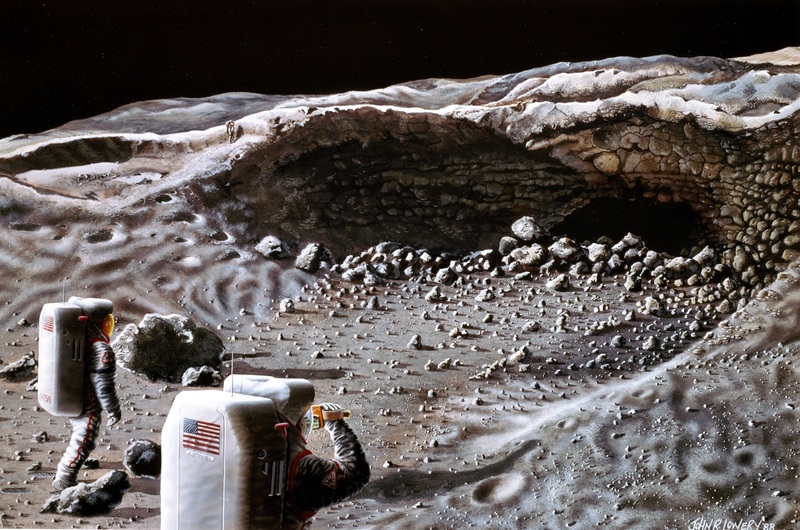 On the Moon, however, lava tubes are much larger, due to the fact that the Moon has only a fraction of the Earth’s gravity (0.1654 g to be exact). For a lava tube to be detecting using gravity data, it would need to be several kilometers in length and at least one kilometer in height and width. Since the tube in Marius Hills was detectable, it is likely big enough to house a major city. In fact, during a presentation at the 47th Lunar and Planetary Conference, researchers from Purdue University showed GRAIL data that indicated how the tube beneath the MHH could be large enough to house Philadelphia. This most recent study was also the subject of a presentation at the 48th Lunar and Planetary Conference. Similar evidence of possible stable lava tubes in the Sea of Tranquility was also obtained by the Lunar Reconnaissance Orbiter (LRO) back in 2010. However, this latest combination of radar and gravity data has provided the clearest picture yet of what a stable lava tube looks like. Similar evidence of lava tubes has also been discovered on Mars, and possible even Mercury. On Mars in particular, chains of pit craters, broad lava fans, skylights and partially collapsed lava tubes all indicate the presence of stable tubes. Based on this latest study, future mission to the Red Planet (which could include the creation of a habitat) might also entail the investigation of these features. In fact, lava tubes could become the means through which a human presence is established throughout the Solar System someday! Venus’ atmosphere is as mysterious as it is dense and scorching. For generations, scientists have sought to study it using ground-based telescopes, orbital missions, and the occasional atmospheric probe. 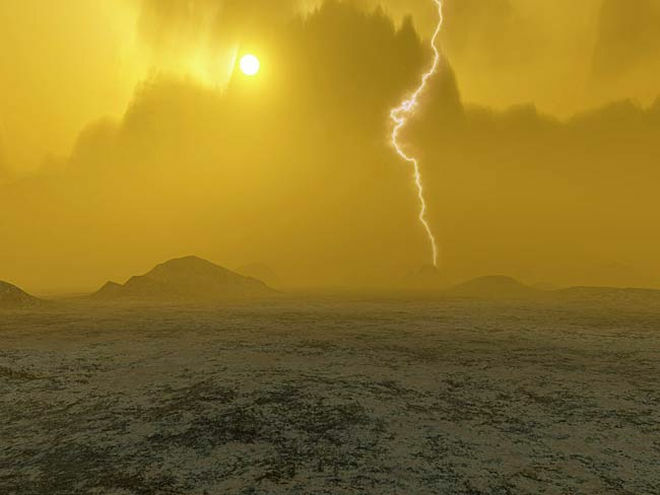 And in 2006, the ESA’s Venus Express mission became the first probe to conduct long-term observations of the planet’s atmosphere, which revealed much about its dynamics. Using this data, a team of international scientists – led by researchers from the Japan Aerospace and Exploration Agency (JAXA) – recently conducted a study that characterized the wind and upper cloud patterns on the night side of Venus. In addition to being the first of its kind, this study also revealed that the atmosphere behaves differently on the night side, which was unexpected. The study, titled “Stationary Waves and Slowly Moving Features in the Night Upper Clouds of Venus“, recently appeared in the scientific journal Nature Astronomy. Led by Javier Peralta, the International Top Young Fellow of JAXA, the team consulted data obtained by Venus Express’ suite of scientific instruments in order to study the planet’s previously-unseen cloud types, morphologies, and dynamics. The atmospheric super-rotation at the upper clouds of Venus. While the super-rotation is present in both day and night sides of Venus, it seems more uniform in the day. Credits: JAXA, ESA, J. Peralta and R. Hueso. Since the 1960s, astronomers have been aware that Venus’ atmosphere behaves much differently that those of other terrestrial planets. Whereas Earth and Mars have atmospheres that co-rotate at approximately the same speed as the planet, Venus’ atmosphere can reach speeds of more than 360 km/h (224 mph). So while the planet takes 243 days to rotate once on its axis, the atmosphere takes only 4 days. This phenomena, known as “super-rotation”, essentially means that the atmosphere moves over 60 times faster than the planet itself. In addition, measurements in the past have shown that the fastest clouds are located at the upper cloud level, 65 to 72 km (40 to 45 mi) above the surface. Despite decades of study, atmospheric models have been unable to reproduce super-rotation, which indicated that some of the mechanics were unknown. This consisted of observing Venus’ night side clouds with the probe’s Visible and Infrared Thermal Imaging Spectrometer (VIRTIS). The instrument gathered hundreds of images simultaneously and different wavelengths, which the team then combined to improve the visibility of the clouds. This allowed the team to see them properly for the first time, and also revealed some unexpected things about Venus’ night side atmosphere. What they saw was that atmospheric rotation appeared to be more chaotic on the night side than what has been observed in the past on the dayside. The upper clouds also formed different shapes and morphologies – i.e. large, wavy, patchy, irregular and filament-like patterns – and were dominated by stationary waves, where two waves moving in opposite directions cancel each other out and create a static weather pattern. Examples of new types of cloud morphology discovered on the night side of Venus thanks to Venus Express (ESA) and the infrared telescope IRTF (NASA). Credits: ESA/NASA/J. Peralta and R. Hueso. The 3D properties of these stationary waves were also obtained by combining VIRTIS data with radio-science data from the Venus Radio Science experiment (VeRa). Naturally, the team was surprised to find these kinds of atmospheric behaviors since they were inconsistent with what has been routinely observed on the dayside. Moreover, they contradict the best models for explaining the dynamics of Venus’ atmosphere. This is not the first time that scientists have spotted a possible link between Venus’ topography and its atmospheric motion. Last year, a team of European astronomers produced a study that showed how weather patterns and rising waves on the dayside appeared to be directly connected to topographical features. These findings were based on UV images taken by the Venus Monitoring Camera (VMC) on board the Venus Express. These findings also challenge existing models of stationary waves, which are expected to form from the interaction of surface wind and high-elevation surface features. However, previous measurements conducted by the Soviet-era Venera landers have indicated that surface winds might too weak for this to happen on Venus. In addition, the southern hemisphere, which the team observed for their study, is quite low in elevation. From this information, it seems that topography and elevation are linked when it comes to Venus’ atmospheric behavior, but not consistently. So the standing waves observed on Venus’ night side may be the result of some other undetected mechanism at work. Alas, it seems that Venus’ atmosphere – in particular, the key aspect of super-rotation – still has some mysteries for us. The study also demonstrated the effectiveness of combining data from multiple sources to get a more detailed picture of a planet’s dynamics. With further improvements in instrumentation and data-sharing (and perhaps another mission or two to the surface) we can expect to get a clearer picture of what is powering Venus’ atmospheric dynamics before long. With a little luck, there may yet come a day when we can model the atmosphere of Venus and predict its weather patterns as accurately as we do those of Earth.